I took this at a bookstore because all of the books on the shelves...YES PLEASE. Bookstores make my OCD heart happy. To Kill a Mockingbird is my favorite novel of all time. 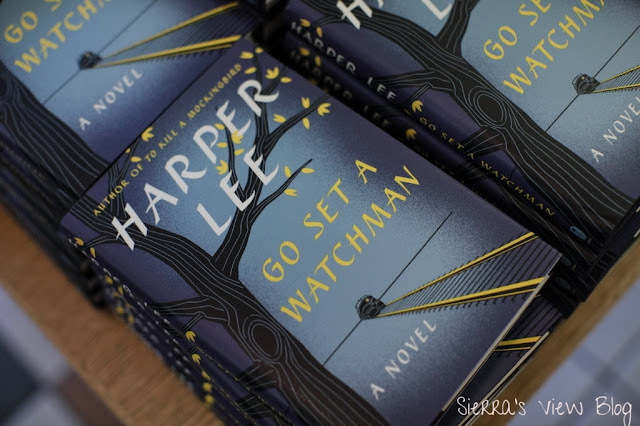 Because of my intense love for this book and all that encompasses it: the characters, the writing, and the story, I was a little apprehensive to read Go Set a Watchman. Despite what many people say, this story is not a sequel to TKAM. It involves some of the same characters: Scout, Atticus, and set in good ol' Maycomb County, but that seems to be it. Scout, who only goes by Jean Louise, in this novel. It is set twenty years later, after Jean Louise has lived in New York City. She returns back to Maycomb to find out that her father and the life that she once imagined, was not as much as a daydream as she had remembered. She struggles with her illusions of her father from the past and dealing with, in a way, "forgiving" her father for his imperfections. A lot of people had many negative things to say about this novel. Yes, it cannot, by any means, be compared to TKAM (can anything, really? ), but I was pleasantly surprised while reading this. This might have been because I was so nervous and negative to begin it and was surprisingly inspired by the lessons and quotes that took place. The controversy surrounding this story is one that causes anyone to stop and think. Atticus and Jean Louise debate, perhaps, even fight, over the issue of race in many discussions. One of my favorite parts of the novel was at the very end when Jean Louise comes to terms with the imperfections of her father, and realizes that he, in fact, was not the perfect person that she had imagined. My favorite part about the story was Jean Louise's narrative voice and the struggles that she goes through. It is one, I think that we can all relate to, especially at this current time. We can relate to the issues of race in our days, and we can relate to the struggle of one day, realizing that your parents are not perfect. My least favorite part of the story was the lack of plot. I do feel like this novel had immense potential, but it was lacking in the story development throughout. The voice and moral were present and quite strong, but the plot was lacking. But, let's also revisit the fact that I am obsessed with the names of these characters: Atticus, Jean Louise, Scout and Harper. I have my future children's names. No, but seriously. Ha! Overall, I give this novel 4/5 stars. +A man can condemn his enemies, but it’s wiser to know them. +She was almost in love with him. No, that’s impossible, she thought: either you are or you aren’t. Love’s the only thing in this world that is unequivocal. There are different kinds of love, certainly, but it’s a you-do or you-don’t proposition with them all. +If you did not want much, there was plenty. +The only thing I’m afraid of about this country is that its government will someday become so monstrous that the smallest person in it will be trampled underfoot, and then it wouldn’t be worth living in. +As you grew up, when you were grown, totally unknown to yourself, you confused your father with God. You never saw him as a man with a man’s heart, and a man’s failings—I’ll grant you it may have been hard to see, he makes so few mistakes, but he makes ’em like all of us. +She was born color blind. +Jefferson believed full citizenship was a privilege to be earned by each man, that it was not something given lightly nor to be taken lightly. A man couldn’t vote simply because he was a man, in Jefferson’s eyes. He had to be a responsible man. A vote was, to Jefferson, a precious privilege a man attained for himself in a—a live-and-let-live economy. +I guess when you're hurt your first instinct's to hurt back. +Integrity, humor, and patience were the three words for Atticus Finch. There was also a phrase for him: pick at random any citizen from Maycomb County and its environs, ask him what he thought of Atticus Finch, and the answer would most likely be, “I never had a better friend.” Atticus Finch’s secret of living was so simple it was deeply complex: where most men had codes and tried to live up to them, Atticus lived his to the letter with no fuss, no fanfare, and no soul-searching. His private character was his public character. His code was simple New Testament ethic, its rewards were the respect and devotion of all who knew him. Even his enemies loved him, because Atticus never acknowledged that they were his enemies. He was never a rich man, but he was the richest man his children ever knew. +She was easy to look at and easy to be with most of the time, but she was in no sense of the word an easy person. She was afflicted with a restlessness of spirit he could not guess at. See more thoughts on my GoodReads.